I’m rarely as organised at Christmas as I’d like to be, but I do usually manage to make my own mincemeat. As I’ve mentioned in my previous mincemeat recipe posts, once you’ve made your own, it’s hard to go back to shop bought. And it’s so easy too. 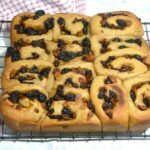 Here, I’ve used it to make the most fabulous mincemeat buns – soft, fragrant and oh so very moreish. I used whisky in this season’s mincemeat, rather a lot of it and I reckon it’s the best yet. I made it with lots of plump dried fruit and my usual chilli and chocolate. The recipe will be appearing on Tin and Thyme at some point but here is one of my chilli and chocolate mincemeat recipes just in case you’re raring to go. Making yeasted buns seemed like a good opportunity to try out my Thermocook‘s bread making function. I found it needed a little hand finishing after the knead function had finished to incorporate bits of flour that had been missed and bring it all together, but it seemed to do the job. I particularly appreciated the rise function, especially as our house is so cold at the moment. The sweet spicy aroma emanating from the oven fragranced the whole house – who needs air freshener? 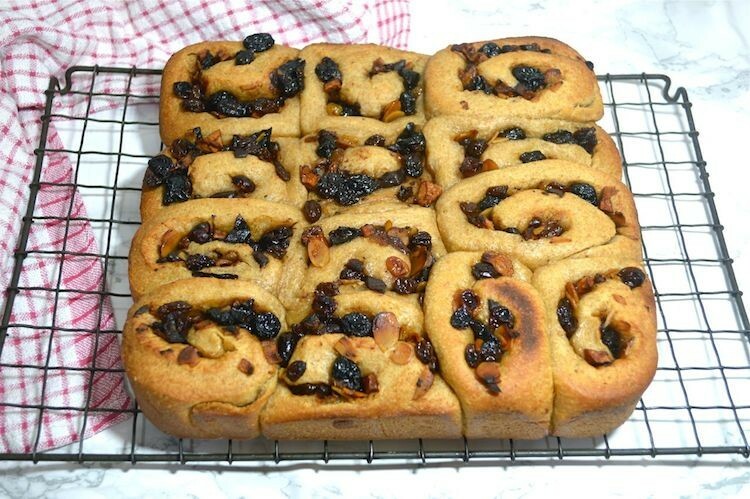 We ate a couple of the mincemeat buns warm from the oven, we just couldn’t help ourselves. They were so very good. Luckily, as there were rather a lot of them, I found they were just as good on day two, three, four and five, warmed up in the oven. CT’s dislike of mincemeat is legendary, but he wolfed these down with no complaint. Result! An enriched slightly sweet dough flavoured with cardamom which is then rolled up with a mincemeat filling and sliced to form individual buns. Warm the milk to blood temperature and dissolve the yeast in it. Remove the seeds from the cardamom pods and grind with a pestle and mortar as finely as possible. Combine all of the ingredients together, accept the mincemeat and remaining 25g butter. Knead for a good ten minutes. Cover and leave to rise in a warm place until doubled in size (about 1 hr). Knead briefly by hand, then roll out on an oiled surface into a rectangle about 30cm by 40 cm. Melt the remaining butter and spread over the dough. Spread the mincemeat over the butter and roll up .... as tightly as possible. Cut the roll into 12 to 16 pieces and space slightly apart in a deep sided oiled tin. I used a 23cm sq tin, but this was a bit too small and a larger one would be better. Cover with a plastic bag or tea towel and leave to rise in a warm place until doubled in size (about an hour). Drizzle the tops with a little water, place another tin over the top to prevent the fruit from burning and to allow the steam to circulate. Bake at 180℃ for about 30 minutes when the buns should be firm, well risen and golden. If you feel they need a bit longer, place them back in the oven for a further 5 minutes or so. Follow the first two instructions above. Fit the kneading shaft into the jug. Place the milk, eggs and 50g butter into the bottom of the jug, followed by the dry ingredients. Set the programme to knead for ten minutes. Set the temperature to 37℃ and leave for 30 minutes to rise. This quantity will make 12 large buns or 16 slightly smaller ones. These buns go off to Janie at The Hedge Combers and Karen at Lavender and Lovage for this month’s Teatime Treats where anything goes. Another one I’d like to try, but there are just not enough calories in a day. A tip for anyone with a cold house and no ThermoCook: preheat the oven to 50 degrees Celsius and turn it of. Then place the bowl with the prepared bread dough inside and keep the door closed. This amount of warmth will be enough to let your dough rise properly. It is a lot cheaper, faster and simpler than heating a whole room/house. Thanks Henk. A good tip. Most os the time I prefer a long slow rise, but sometimes you just need to bake something quickly. oh yes! Anything with left-over mincemeat is so good to me!!! I love these, don’t you just want to tear into them.. well, you probably did but I know I do! We did sort of consume them with gusto Dom. I know you are a big fan. I must do a WSC for mincemeat sometime – maybe next December. I really am beginning to think of mincemeat as the taste of January rather than December. These sound so inviting and, if I’m honest, more inviting than a mince pie at Christmas. I’m full of respect for your mincemeat making – you’re right that’s it’s so much better than what you can find in the shops. I used to make it every year but I haven’t been able to find time in recent years. Oh Phil, you need to find time again for your cooking – so many splendid recipes I feel I’m missing. Know what you mean about mincemeat in January, it seems more palatable then somehow. Thanks Kevin. The ThermoCook has a surprising number of uses I’m finding. I love mincemeat, especially after Christmas when it feels a bit naughty to be eating it still! The buns look wonderful, and I am impressed you can use the Thermocook to make the dough, that is a great function. Thanks Lucy. You know I’m not sure I had a single mince pie this Christmas, so I was definitely due some mincemeat something or other. I always think the best bit about mincemeat is finding lots of exciting ways to use it up after the big event. …… These are a great idea. Yum! We should call January “Getting Creative with Mincemeat Month”. I love the sound of this so much! Homemade mincemeat, yeasty dough, aromatic cardamom! This ticks all the boxes! You’ve made these sound so good Elizabeth, I’m tempted to go bake another batch right now. These look so lovely Chocolette, I still have oodles of beetroot mincemeat left over from Christmas, and will definitely be giving these a try in my ThermoCook! Ooh yes Kate, I’d forgotten about your beetroot mincemeat. I bet that would work a treat in these buns. I’m quite shocked to discover you are not a cardamom fan Shaheen. It’s such an aromatic spice and with its hint of citrus I just love it. Oh my! I can almost smell them from here! I love cardamom, combining it in these little buns of yeasty delciousness and mincemeat to boot is genius! You’re making me feel like I really need a mincemeat bun now Chris.